Michigan supports a wide array of coastal natural communities that are endemic to the Great Lakes region and rare globally including lakeplain prairie, Great Lakes marsh, open dunes, alvar, and coastal fen. These ecosystems face a variety of threats, including the establishment and spread of invasive species. There is a critical need to develop scientifically credible and affordable methods for detecting and monitoring the impacts of invasive species in coastal ecosystems and assessing the success of restoration efforts to control invasives. Because monitoring efforts are costly, time-consuming, and subjective, monitoring is often assigned the lowest priority in management plans and is often bypassed. 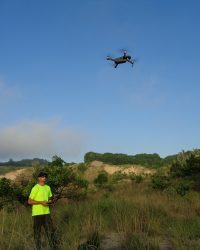 Michigan Natural Features Inventory and Michigan Aerospace Corporation are partnering to develop a low-cost monitoring platform using drones equipped with high-resolution cameras and deep learning algorithms to identify invasive species in high-quality coastal ecosystems. In this presentation we will share results of our first year of research. Joshua Cohen is the Lead Ecologist of Michigan Natural Features Inventory (MNFI) and has worked for MNFI for the past 19 years. His primary duties involve refining and revising the natural community classification through ecological inventory and sampling, literature research, and data analysis. 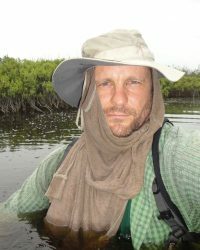 He is also responsible for classifying conservation targets and prioritizing areas for conservation and restoration; creating and delivering training sessions for resource professionals on biodiversity and ecosystem management; and designing and conducting vegetative sampling, ecological mapping and modeling, monitoring, and surveys for natural communities and threatened and endangered species. Cohen is the lead author of the recently published “A Field Guide to the Natural Communities of Michigan” (Cohen et al. 2014). Matthew Lewis serves as Chief Technology Officer of Michigan Aerospace Corporation (MAC) and director of its Data Exploitation Business Area. Dr. Lewis received his Ph.D. in physics from the University of Michigan for work describing cosmological models in the context of string theories. At MAC, he focuses on the development of machine learning techniques for defense, biomedical, clean energy, and space applications. Lewis is the author of many peer reviewed papers in several fields, including (Lewis 2013), which introduces new hierarchical machine learning models for decision-making and classification.